YouTube is possibly the most versatile platform the information age has produced. From music and viral videos to news and how-to videos, it’s 819 billion hours of content has something for everyone – no matter their walk of life. 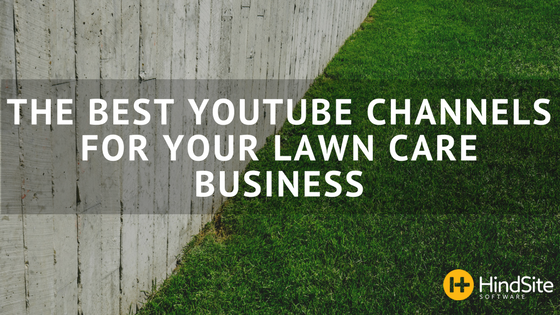 YouTube and the lawn care industry are a match made in heaven. Not only is it an expansive resource for learning and growing your business. But you can display the quality of your work through the most visual medium known to man – video. From product reviews to everyday-useful advice, Lawn Care Nut offers great content for any type of lawn care or lawn maintenance business. Recently the channel has started adding more real life lawn care stories. Stanley “Dirt Monkey” Genadek, is a fellow Minnesotan whose videos cover everything from real life stories and lawn care how-to tips to equipment and tool reviews. Coming to you from Wichita, Kansas, Top Notch Lawn Care frequently posts vlogs (i.e. blog formatted videos) to provide viewers a glimpse into their business, while also sprinkling in occasional equipment reviews, business advice and lawn care tips. B&B Lawn Care's YouTube channel has both entertaining and informational content. Blake Albertson, the guy behind the camera, has an eye for great shots. Our personal favorite is their drone-shot video that peers down as they work in a Kansas City neighborhood. Just like the name says, the channel’s goal is to make you a Lawn Care Millionaire. Providing useful business and marketing tips specifically catered to the lawn care industry. Jason Creel has created a channel full of practical advice to help you build a better lawn care business based on his own experiences. Name: Usually it makes most sense to name it after your business but if there’s already a similar channel out there you’ll want to make the necessary changes to side-step a potential law-suit. Music: Speaking of legal hot water, avoid using music that’s copyrighted. Rather check out YouTube’s free online music library. Storage: Make sure you’re able to properly save your video by keeping enough space on your computer or external hard drive. Filming: Use multiple cameras at different angles while filming a project/jobsite. Once you’re able to start editing you’ll have more content to choose from, resulting in a better end product. Software: Check out Adobe Premier Pro or iMovie (if you're working on a Mac) to edit your videos. If you have a GoPro and need to turn photos into video, you’re likely familiar using GoPro Studio. Length: It’s best to limit video to four minutes and always balance out your content so it’s not front or back heavy - allowing your video to grab and maintain viewer’s attention. Website: If you’re going through all this to create and post cool videos it’s a good idea to put them on your business’s website so you can reach an even greater audience. Maybe you’re not the next Spielberg and making videos doesn’t strike your interest. Totally fine. Following the right channels or simply using it as a resource when needed, can provide you with information to improve your lawn care business.